The IRS is using a fraudulent accounting practice, in the spirit of Enron and Bernie Madoff, to expose US persons to increased FBAR fines. The term “aggregate” in the FBAR rule has been a thorny issue, in which there has been not a little confusion. For example, at the Expat Forum Mach7 related a story of about an accountant he consulted who thought that filers need not include accounts below the $10,000 threshold. I had a big discussion with an Accountant on this very matter…not my Accountant, but one with a PTIN#. When he finally called me back, he was concerned that he had been doing peoples taxes for 4 years like this, and had never included an account above the 10K value…when in actuality he should have. A certain Rifleman (British in Malaysia) responded to Mach7, saying that this accountant is an idiot because he doesn’t even understand what the term “aggregate” means. A simple dictionary definition would make the IRS guidance crystal clear. (1) Let’s say you had $9,999. You held it in your chequing account for five days. Then you put it in your savings account for two months. Then you put it in a GIC for two months. Then you opened up an RRSP and put it there. The highest balance in each account $9,999. Now is the aggregate $9,999 or 39,996 (9999*4 accounts)? If the IRS decided to assign a non-wilful fine of $10,000 per account, you will receive a fine of $40,000. But the total amount of money you ever had was $9,999. (2) Let’s say that you borrow $40,000 from a HELOC (home equity line of credit) and you put the money into five different accounts on five successive days: the aggregate balance is now $200,000–according to the IRS, because nowhere in the guidance does it allow you to subtract your liability from your account balance. Now we are talking about some real money here and so the IRS determines that your non-disclosure was wilful. So they fine you 50% of the total aggregate sum in the account: $100,000. None of the IRS instructions that I have read offer the ability to count a debt account with a negative balance in the FBAR sum. 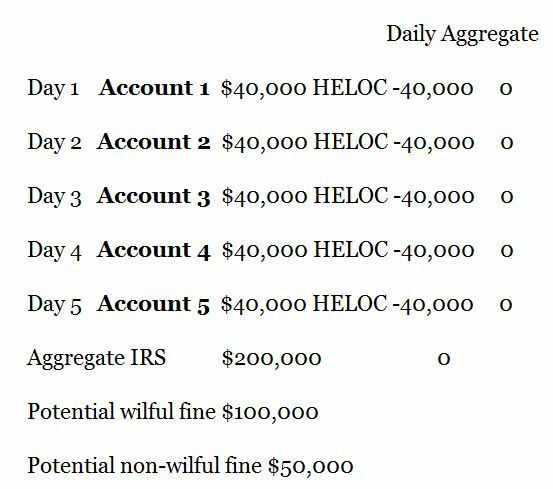 But in the above scenario the liability in the HELOC offsets 100% of the account balances 100% of the time. The actual net worth of the person is still zero. This makes the term aggregate into meaningless nonsense, not something that a dictionary can clear up (contra Rifleman). So I say the aggregate is zero. The IRS says the aggregate is $200,000. Who is right? The above accounting takes into consideration two things (1) Chronological factors (how much money is where and when it is there). (2) Offsetting debt. So by any reasonable standards of accounting, the total aggregate is zero. When corporations like Enron or the Banks shift assets to make the balance sheet look solid, we call it “fraud”. When the IRS does it is still fraud, but one which the IRS foists upon US persons in order to make their “crime” of unreported FBARs seem like something really bad. This is a very practical issue: for I would venture to say that many people would benefit from being able to count negative balances from their mortgages, lines of credits, and credit cards. They would have a much lower “aggregate” sum, and would find either that they are far below the reporting threshold or that, at very least, they are subject to a much lower regime of non-wilful or wilful fines. But can we expect the IRS to do honest accounting when they have no understanding of basic civics, i.e., the US Constitution? If you think it would help, you can do whatever you like with my latest email to my Canadian government representatives. One of these days I may get / we may get answers on what the Canadian government has negotiated with the USA regarding FATCA. I’m bloody tired of waiting. Thank you for contacting me about the ongoing situation regarding the potential for Canadian citizens born in the United States to be pursued for US income tax by the IRS. As you know, the situation is complicated and the legal status of Canadians born in the US, the threat of IRS action, and the possibility of real punitive action is still unclear. As a Canadian citizen born in the US, I can assure you that I share your concerns and am dedicated to defending the equality rights of all affected citizens. I am dedicated to taking action on your behalf. I have sent correspondence to the Prime Minister on the issue. The government has taken the position I urged and is forcefully advocating that the US stop targeting law-abiding Canadians in pursuit of those US citizens hiding in the Cayman Islands. In addition, I recently met with the US Ambassador to Canada, David Jacobson. He is also very much absorbed by the controversy. His main message to me was that I should share with my constituents his wish that we “stay calm.” He indicated to me that he understands the issues and is working closely with officials at all levels of government in the US and Canada to find a pragmatic solution to this problem. You are not alone in this situation. Many are seeking a solution to the problem. I will keep you posted as I work to find a sensible approach. In the meantime, please keep me posted through my constituency office of any changes in your situation. I appreciate Ms. May’s reply to me though it sounds like that sent to others; doesn’t address my son’s RDSP situation. I still don’t understand her reference to long-gone US Ambassador to Canada, David Jacobson, who has, in my opinion not been at all an ally to or advocate for ‘US Persons in Canada.’ His non-response to my correspondence about the same as that from Linda McQuaig. I don’t think any US Ambassador to Canada is going to an ally of ours. 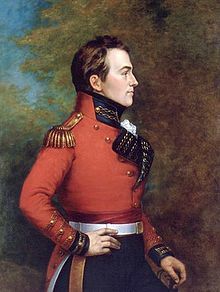 I call myself an expat but have not given up US citizenship and don’t plan to unless Neo-cons prevail. I have been investing US funds in my foreign country and have had no income or sales while speculating on ag land. I get the point that IRS by using ‘agreggate’ reporting easily double potential liability if fined. To begin, most off shore residents have US Dollar accounts to receive home funds and then convert to local currency or other exchanges when doing small business in more than one foreign country. Its the same money. However, a clue to the enforcement problems the IRS has with money laudering is built into the FBAR reporting form. They ask if the taxpayer has 40 or more accounts and then 20 or more (?) So, launderers use tactics like spreading money over multiple accounts to keep under the $10,000 limit. Separating the wheat from the chaff is unfortunaely not an accurate process and the criminal element becomes a reality in our lives because of international treaties created because of oligarchs and dope dealers. The best way to combat drug criminals is, of course, to take the profit out of their trade by decriminalization of drugs, world wide.